The pulled pork, grits and eggs at the Lodge. The Lodge—a little Adirondacks in Williamsburg—was built for biscuits and gravy and brunch food that sits in your stomach like southern fried culinary bricks loaded with butter and goodness. The type of food meant to soak up 2-for-1 Bloody Marys served in Mason jars and morning whiskeys. But now that every brunch boite in Manhattan serves hearty cold-weather fare that instantly puts walrus blubber on you to protect you from the cold, the Lodge had to go one step further to represent for Brooklyn. 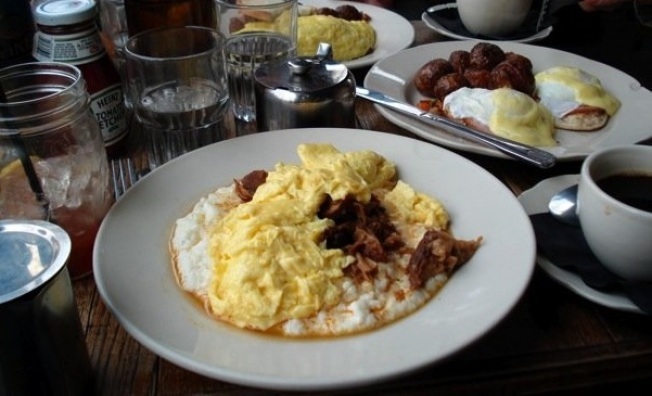 Enter the totally over-the-top pulled pork, grits and eggs. Your move Braeburn.